According to the International Food Policy Research Institute’s Global Hunger Index (GHI) 2017, with 14.7 percent of the country’s children stunted and 21.4 percent of children under the age of five already wasted, Sri Lanka finds itself among only four countries in the world to have every fifth child wasted. The other countries with over 20 percent wasting rates are India, Djibouti and South Sudan. The country has not only seen its hunger level stagnating at 25.5 percent in 2017 as it was in 2016, it has also seen a rapid rise in the prevalence of wasting among its children. 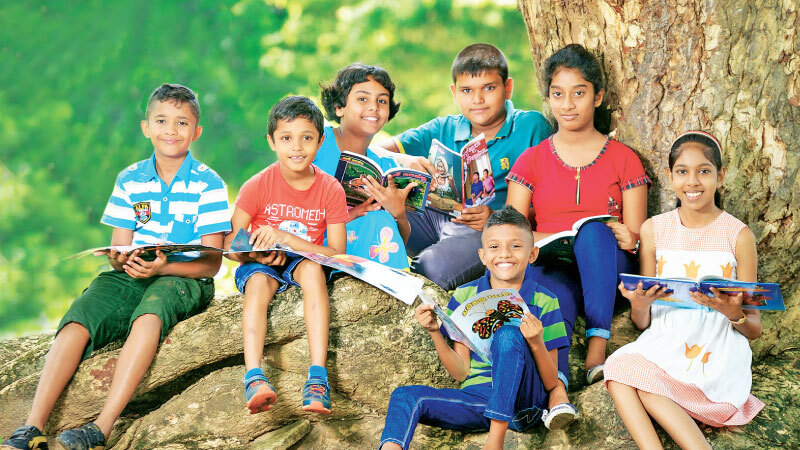 Over the five-year period 2012–2016, the prevalence of wasting in Sri Lankan children under five years of age has increased to 21.4 percent, as against only 13.3 percent in 2006–2010. The Health Ministry’s Nutrition Coordination Unit Director Dr. Rasanjali Hettiarachchi said that Sri Lanka has issues pertaining to undernourishment, but she does not think the percentage could be as high as mentioned by GHI. 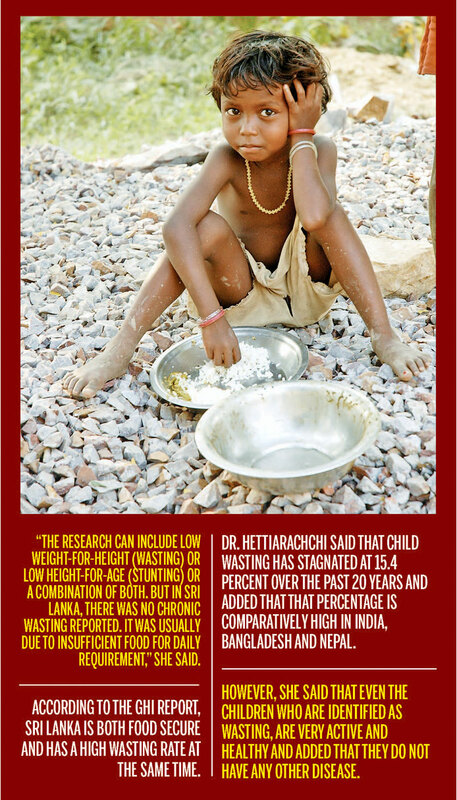 “The research can include low weight-for-height (wasting) or low height-for-age (stunting) or a combination of both. But in Sri Lanka, there was no chronic wasting reported. It was usually due to insufficient food for daily requirement,” she said. Wasting is sometimes referred to as ‘acute malnutrition’ because it is believed that episodes of wasting have a short duration, in contrast to stunting, which is regarded as ‘chronic malnutrition’. However, according to UNICEF, nearly one-third of children under five in the developing world are stunted. Wasting, or low weight for height, is a strong predictor of mortality among children under five. It is usually the result of acute significant food shortage and/or disease. Dr. Hettiarachchi said that child wasting has stagnated at 15.4 percent over the past 20 years and added that that percentage is comparatively high in India, Bangladesh and Nepal. However, she emphasised that no chronic wasting was reported. Even though Sri Lanka has performed well on several indicators like affordability (54.8), availability (52.8) and quality and safety (49.5) of food, the same GHI also found alarming rates of wasting among the children of the country. Therefore, according to the report, Sri Lanka is both food secure and has a high wasting rate at the same time. According to GHI, nearly 21.4 percent of children fall through the safety net into malnutrition and wasting, while Sri Lanka can be performing well on affordability and availability of food. Dr. Hettiarachchi, however, agreed that the country did not have a good position pertaining to child wasting. “The Health Ministry has taken several measures to deal with these issues, but we are yet to see a productive result,” she said. She further said Thriposha is given to all children with low weight and special programmes were initiated at the estate level to improve the health of children there. Dr. Hettiarachchi explained that only two percent of the whole child population has been diagnosed with severe wasting and the remaining 15.4 percent have mild wasting. “There is only a difference of 400g from the marginal level to the average level and the two percent of severe wasting can be due to a disease. Wasting due to disease cannot be considered as chronic wasting or due to insufficient food,” she said. The data available further complicates the issue: the paradox of food security in the face of such high figures of wasting is further evidenced by the poverty profile of the country. According to GHI reports, many children seem to go to sleep with empty stomachs despite the country doing much better than its neighbours even on poverty estimates. The government listed only 4.1 percent, or 843,913 people, as poor in 2016, down from 6.7 percent in 2012–13. In contrast, India, the only other country in the region with wasting among children over 20 percent, still has 21.92 percent of its total population officially living in poverty. 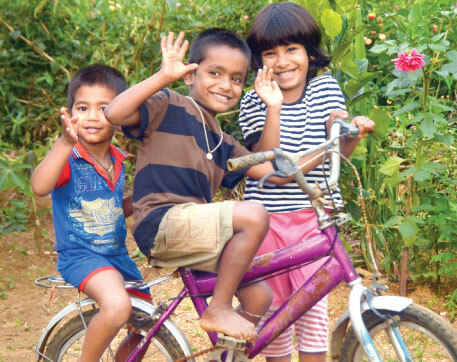 Wasting among children in Colombo is still a high 12 percent, down only one percentage point from 2006. Dr. Hettiarachchi revealed that wasting of children is high in the Western Province as well, especially in the coastal and slum areas. She said the highest figures were reported in Moneragala, Hambantota, Trincomalee, Anuradhapura and Nuwara Eliya, but the population of each is low compared to the Western Province. “We are yet to find the reason why the percentage has stagnated for years without an improvement and the Health Ministry is working on it,” she said. However, she said that even the children who are identified as wasting, are very active and healthy and added that they do not have any other disease. Further, though one still struggles with data, the demography of hunger in the country suggests it to be widespread and not confined to remote, underdeveloped parts of the country. According to the Census and Statistics Department’s demographic and health survey of 2016, 17.3 percent of children below five years are stunted and there has been no change in the data for the past 10 years. Yet, there was a slight improvement in the measure of underweight children (down 1.5 percent) and wasting (down 0.4 per cent), compared to the 2006 figures. The prevalence of wasting in the Colombo district which was 13 percent in 2006, has reduced to 12 percent. Wasting in the past 10 years has remained high in most districts with a record high of 25.5 percent in Moneragala in the Uva Province. In the Puttalam and Anuradhapura districts wasting is at 19.5 percent. In the past 10 years with a 6.5 percent to 15 percent drop in the numbers, Batticaloa, Trincomalee and Ampara have shown a considerable improvement. In the Trincomalee district that had the highest percentage (28 percent), it has declined to 13 percent in 2016. Nutrition Society of Sri Lanka President Dr. Renuka Jayatissa said that the data should be more accurate while addressing the issues concerning nutrition. Dr. Jayatissa said that the Health Ministry alone could not handle the issue and added that all ministries should take necessary measures so that the country could witness a remarkable improvement in children’s nutritional status. “The nutritional level of children depends on the availability, accessibility and affordability of the food as well. Prevention is more important than curing the disease,” she said. Dr. Jayatissa noted that the health system in Sri Lanka was different to that in many other countries. She said community health status is maintained by and nutritional advice is given by the Medical Officers of Health. She further said that the people have enough knowledge about nutritional health and added that the problem was that healthy practices are not implemented. However, health authorities must take note of the fact that although the government spends billions of rupees on health services, it has not been able to address malnutrition effectively.